Crusaders celebrated a hat-trick of awards at Monday night’s BT Sport Northern Ireland Football Writers’ Association gala dinner. Fresh from their Danske Bank Premiership title success last month, the Seaview club were toasting further success at the Ramada Plaza Hotel in Belfast. Stephen Baxter was crowned BT Sport Manager of the Year, while Paul Heatley claimed the Footballer of the Year title. And the treble was secured when teenage winger Gavin Whyte was named Young Player of the Year. It caps off a memorable season for the Shore Road men who lifted their first title in 18 years. It completed a full haul of winner’s medals for proud boss Baxter who has now won every domestic honour available during his 10 years at the club. “I am so proud of the players,” Baxter said. “Winning the title was a building process over 10 years. The players deserve immense credit. They were exceptional all season and they deserve every praise they get. Heatley crowned off a stellar season by lifting the top player gong. The 27-year-old scored 29 goals in 41 appearances en route to helping the Crues secure the title. “It was a special season for the club,” said Heatley, who was also recently named Ulster Footballer of the Year. Team-mate Whyte – who operates on the opposite flank to Heatley – enjoyed a fantastic debut season with the Crues. The 18-year-old became one of the most feared wingers in the Premiership to earn interest from a number of cross-channel clubs. “It has been a great season – unbelievable,” Whyte said. Meanwhile, Carrick Rangers claimed the Non-Senior Team of the Year following a stellar treble of their own. The Taylor’s Avenue club won the Championship 1 title to earn promotion to the top flight, and also lifted the Steel and Sons and Intermediate Cup. The Championship Player of the Year went to Bangor winger Jordan Forsythe. 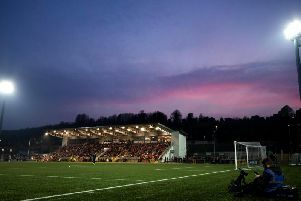 Forsythe – who is set to move to Premiership champions Crusaders – bagged 25 goals to help the Seasiders finish second in Championship 1 and reach the County Antrim Shield final. Also on the night Northern Ireland legend Gerry Armstrong was inducted into the Dr Malcolm Brodie Hall of Fame. Armstrong scored 12 goals in 63 appearances for his country, including a famous winner against hosts Spain at the 1982 World Cup finals. The striker spent most of his career in England with clubs including Tottenham Hotspur and Watford. The 60-year-old also played in Spain for two years with Real Mallorca where he scored 13 goals in 55 appearances. Also last night current Northern Ireland striker Kyle Lafferty was named the International Personality of the Year. Lafferty has enjoyed something of a renaissance in the green shirt, scoring five goals in five opening Euro 2016 qualifiers to keep Michael O’Neill’s side on course for next summer’s finals in France. Manager O’Neill was present to collect the award on Lafferty’s behalf. “Kyle is an important player for Northern Ireland, and he has proved that in the European campaign,” O’Neill said. “He is a focal point for our attack and his goals have been invaluable for us. Also last night, Glentoran stalwart Ruth McCreery was presented with the NIFWA Merit Award.